Remakes, re-imaginings, reboots, re-inventions, other re-… Hollywood seems to like re-cycling of ideas and have been in serious innovation drought for years. I know, remakes of classic (and not so classic) movies are nothing new, neither are sequels – but there are a few things they could do in order to inject some imagination into their fantasy films. This essay was originally written for Planet Origo and published there in February 2009. The essay does not pertain directly to specific Scandinavian films, but suggest Hollywood take more notice of themes that are native to Nordic cinema. Fortunately, the sci-fi and fantasy film genres have been spared the biggest remake waves. Horror has been hit much worse, with classics such as Texas Chainsaw Massacre, The Hitcher, Friday the 13th, and Helloween having been remade, among many others. There was even talk about The Evil Dead getting a remake, and it actually has an IMDb entry labelled “announced”. Is nothing holy to Hollyweird??!?! Fantasy films are in a slightly different position. While horror movies have been huge since the 1970s and established long before that, fantasy and science fiction films were mocked and looked down upon longer, and it wasn’t until the mid or late 1990s that fantasy in litterature became the foundation for a wave of movies. Granted, fantasy movies have been around for a long time but in fact the growth in the 90s in numbers of young people who read fantasy stories paved the way for movie adaptions of popular novels. With The Lord of The Rings and Harry Potter it was proven true that popular fantasy books could translate well to box office success. In other words, the makers of fantastical cinema have a vast library of already proven stories to choose from, a library that is not yet empty. They don’t need to recycle. However, it is just a matter of time before remakes or sequels to popular 1980s movies start to appear. They are already preparing remakes of He-Man and V, in the wake of the reboots of the comic franchises Superman and Batman. So, Hollyweird, let me give you some advice. A free tip, an original and new idea you have not explored much before. You can pay me a hefty royalty if you want. Here it is: Nordic mythology. I am not talking about Viking movies. Vikings have acted in front of the camera since at least the 1950s, usually with a large dose of, shall we say, artistic freedom. Myths and misconceptions and adaptions of Viking history and / or facts are, if not a staple, at least well known among movie fans. No, I am talking about Nordic mythology; the gods, beliefs, myths and legends of the Vikings. You know, Thor, Loki, the giant jotnar creatures, Odin, the eight-legged horse Sleipnir, etc. Also, a whole range of worlds and universes inhabited by magic, spirits and supernatural creatures. There’s much to dig into! 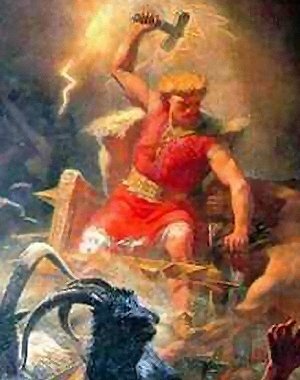 I am not suggesting a movie about Norse mythology, but perhaps Hollyweird could look to Scandinavia for some juicy inspiration for original stories. It has been done before, in all fairness, although not as a rule when making fantasy films inspired by the past, or even when making “plain” Viking epics. Tolkien took alot of inspiration from ancient Scandinavian culture when writing both The Silmarillion and The Rings trilogy, in fact so much that the mythology crept into popular culture and has become clichés. The John McTiernan-directed The 13th Warrior (1999) is borderline historical fantasy as it involves the fictional and non-historical cave cannibals attacking a Viking village, and Outlander (2009) sees Vikings and space aliens clashing, a rare thing even in fantasy movies. None of these two movies draw much from actual Viking mythology though. Beowulf (2007) is probably the best cinematic adaption of old Scandinavian legends (though it’s an English poem), even though the character Beowulf supposedly lived 4-500 years before the Viking age. Thunder god Thor and his mighty hammer, Mjolnir. However, apart from the Thor comic books from Marvel Comics, Nordic mythology is not exploited enough in popular entertainment. In stead, Greek legends, Arabian folk tales and Asian history forms much of the basis for fantasy epics, with the occasional dip into Britain’s Merlin or American Indian folkore. I guess there is alot to explore in sub-Sahara African legends too (Tarzan aside – it wasn’t really an African legend) but being a Norwegian myself, I’d like to see more Nordic mythology on the big screen. So there you have it, Hollyweird. Why don’t you google or wiki terms such as Jotun, Yggdrasil, Valhalla, Ragnarok, the vættir, Freya. You don’t even have to pay authors any rights, because all Nordic mythology is in the public domain, one could say. There goes my royalty cheque! I am of course available as historical consultant, and won’t charge you more than you can afford. Addendum: After this essay was written, Marvel studios has filmed Thor under the direction of Kenneth Branagh. Scheduled to open on May 6th, 2011, the film is based on the Marvel comic book rather than actual Norse mythology, and is as such more a comic book movie than a Norse mythology movie. Still, we applaud the idea!